Do you need an article or blog post written? I offer these services at reasonable rates. Interested? Hire Me! This article was last revised on 08/26/17. Most runners are of the mindset that running long is a workout reserved for preparing for a half marathon, full marathon, or an ultramarathon. In truth, theres a bit more to the story. They are an important part of a balanced training program for all of us. It is just one aspect of the 10 habits of highly-successful runners. Long distance runs also provide important benefits for athletes preparing for a 5K, 10K, or, well, any distance. It also shakes things up for those burning calories on a weight loss program. In short (so to speak), longer distance, slower workouts are simply one element in any balanced running program. Easy runs should make up most of your program to avoid injury. Then add in some interval workouts, fartlek, tempo runs, and sporadic pick-ups to activate your fast-twitch muscle fibers for developing speed. Add some hill training to the mix to boost your leg strength and to teach the legs to deal with lactic acid build-up. Whatever type of workout you have on your plate today it is important to adhere to your workout warm-up routine. It might not seem necessary for a slow long run but it is. And there is something to be said for conforming to habit to keep you honest. Running Times coach and columnist Greg McMillan points out that there are 3 physiological adaptations that distance training provides. New capillary growth. What are capillaries? The smallest blood vessels; the more you possess, the more oxygen delivery your body is capable of. This enhances your ability to do work. Capillaries are also important in the process of dissipating heat as they flow more blood close to your skin. Musculoskeletal strengthening. As Arnold would say, Ill pump you up! In a manner similar to pumping iron to strengthen target muscles, when you add stress on your legs it promotes ligament, tendon, and muscle strengthening. As an added benefit, the load-bearing aspect of running instructs your bones to soak up available calcium in your body, making your leg and hip bones more dense. Great news for post-menopausal women trying to avoid osteoporosis. Enzyme changes. Running long promotes an increase in the amount of enzymes in the legs. Most runners do their long runs when they can carve out the time for both the run and the recovery; this usually means the weekend. Just look at a marathon training schedule; two things stick out. First, run distance increases adhering to the 10 percent rule. Secondly, the 10% build-up happens every other week in many cases; the common distance on the alternate week is generally about 10 miles for a good maintenance-distance run if you are training for a marathon. If not, dont worry, long runs are relative. If your daily run is 2 miles, you would benefit from a long distance as short as 5 miles. Why not make your long run a social event? This is one of the best aspects of running clubs. Its a lot easier to roll out of bed in the sleepy pre-dawn hours when you know your cohorts are waiting for you. 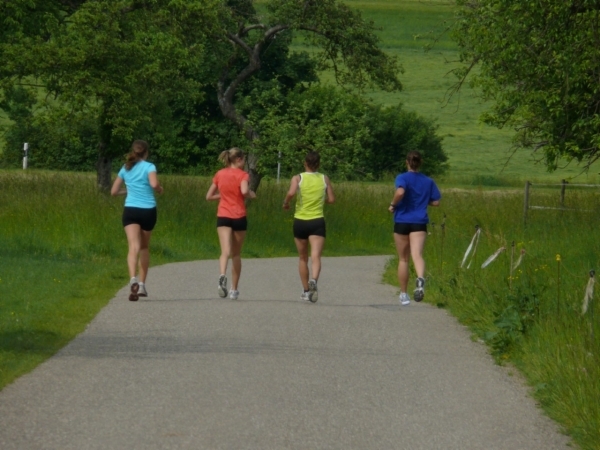 In fact, distance training and comradeship is the foundation of many running clubs. For example, organizations like USA Fit have made a cottage industry of it, and in some eyes, have taken the concept too far. Theyre everywhere; in Texas alone there are 20 clubs. Organizations like this seem to be largely responsible for the growing phenomenon of marathon walkers. Not that there is anything wrong with that as long as the race organizers let walkers start at least a couple of hours before the gun for the runners goes off.